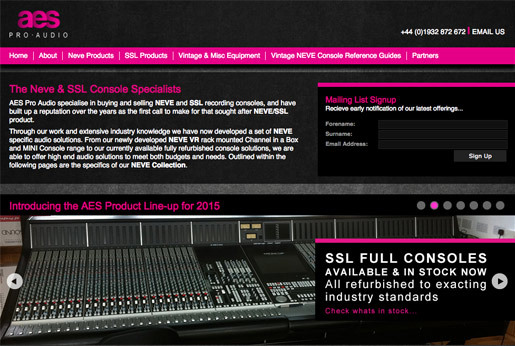 Our partners, AES Pro Audio, are the premier supplier of vintage, used SSL and Neve consoles and SSL cards. Full refurbishment on Neve/SSL consoles to their original condition, extending or reducing frame size’s, and custom requirements to your specifications. All work is undertaken by ex Neve/SSL technicians, and warranty on completed projects as standard. We stock NEVE/API/CALREC modules and vintage outboard microphones. Most importantly all stock is owned by AES Pro Audio; we do not broker.